Can Monty work his way through 40 levels in order to rescue the princess, while collecting all the gold on each level to open the door that leads to the next one? It's a big challenge. The levels are filled with monsters which you must avoid touching, or you'll lose one of your five lives. It's a very old game and it shows. 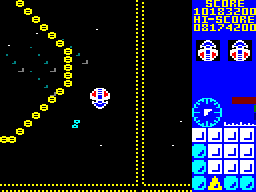 The graphics are rather primitive, and so is the music, which plays the same 20-second tune over and over again – although the tune isn't actually that annoying. No doubt there is a lot of nostalgia in this game for some people, but since I never owned it when it was released back in the CPC's earliest days, I have no strong feelings for it. The Survivor Zero Corporation has developed a range of biological weapons known as Macro-Genetic Mutoids, or mutants, and you have been chosen to enter the sector where they are held and destroy them. Each mutant is contained within one of fifteen zones located in outer space. You must enter each of the zones in your spaceship and retrieve a component of a self-destruct mechanism which must then be assembled in the control zone. The mutants themselves are little more than pretty, psychedelic, swirling patterns, which are fairly interesting to watch. However, the controls can be unresponsive, and some of the mutants are so deadly and so difficult to avoid that it seems practically impossible to complete all fifteen zones. Mutan Zone has everything you'd expect to find in a good game concercing graphics, sound and gameplay. Unfortunately, all these features become spoiled by a frustrating level of difficulty. The game is divided in two different parts that are loaded separately. On the first one you take a perilous walk through the mutant zone, while on the second one you ride a sort of flying bike. You start the game with a ridiculous amount of lives. Nevertheless, you'll find a mini-game on each part that allows you to gather more lives, but then again, these mini-games are too hard and rather than increase the lives counter, you'll lose lives even before playing the game itself. 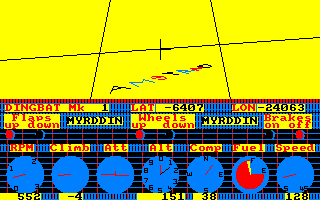 This was one of the first 3D flight simulators to be released for the Amstrad CPC, so it's rather basic as a result, with everything being drawn on the screen in wireframe 3D – and very slowly indeed, with a lot of flickering. Compared with later flight simulators, it is rather lacking in features, although this means that it is relatively easy to start the engines and take off – but landing the plane will take a little practice! Flying around the landscape, searching for the various objects marked on the map, is fun at first, but there is no objective or series of missions to complete, so exploring the landscape is all that you can do. It may have been good in its day, but much better simulations have been released for the CPC since then. 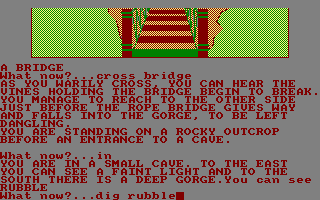 Another text/graphics adventure from Loriciels. You find a message in a bottle written by a young woman who is being held by a mad scientist, and you decide to go and help her! Your adventure starts in a cave, and you must find the appropriate objects in order to progress. You must think quickly because your energy decreases every second and as soon as it reaches 25%, you're dead! Every wrong step means death too, and it's really trial and error, because there are a lot of traps, holes, etc. A good map will prove useful to survive more than 5 minutes... The graphics are cute, but it isn't enough to save the game from mediocrity. 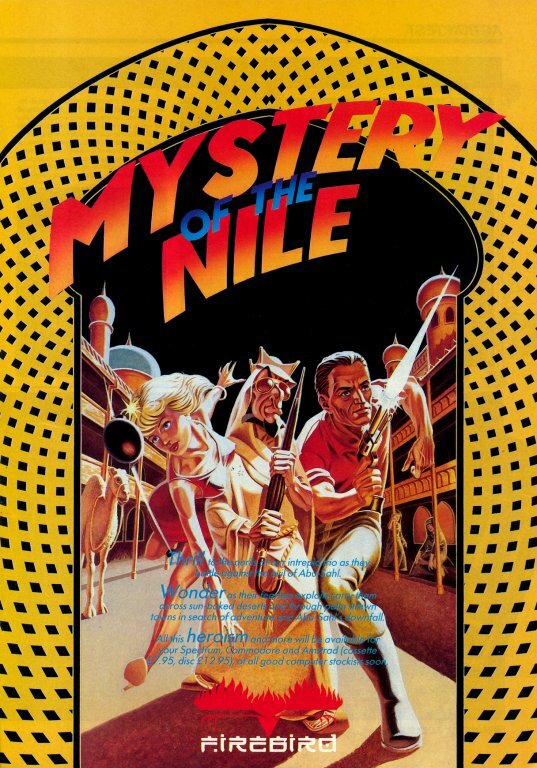 Abu-Sahl has stolen the immensely valuable Jewel of Luxor, and a trio of characters – Janet Dwight, Nevada Smith and Al-Hasan – set out to recover the jewel. 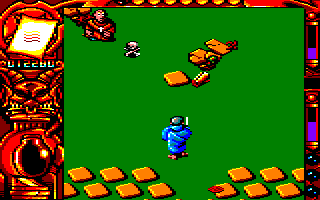 At the start of the game, Al-Hasan and Nevada are being held prisoner, so you control Janet, who must rescue them. However, before you can do so, you must kill all the enemies on each screen using bombs. Soon, things become more hectic, as you can switch between the three characters – although the characters you don't control will quickly wander about the screen and get themselves killed! This makes the game quite frustrating. The difficulty level is also very unforgiving; make even the tiniest mistake and you are punished for it. Well, this is actually a Spanish game that was originally released as El Misterio del Nilo, and you know how difficult most Spanish games are! You're a young wizard who made a mistake in a magical formula and scattered all the spells and phials of his master, the Great Wizard. So you have to visit many parallel worlds to get them back from evil forces. Never mind the storyline, Mystical is a shoot-'em-up – and a very good one. The graphics are gorgeous, the animation is smooth (though a bit sluggish at times) and the tune during the intro sequence is great. But it's a shame there are no sound effects in the rest of the game (lack of memory, perhaps?). Every time you collect a spell or a potion, you obtain a new power. There are many different characters and spells, which prevents boredom because the game is otherwise rather repetitive. 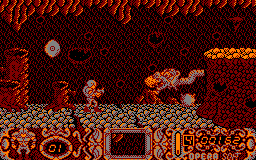 With a greater variety in the design of the levels (and with sound effects! 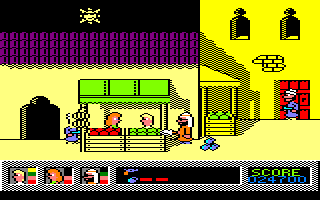 ), Mystical could have been one of the very best CPC games. Incidentally, the cartridge version is exactly the same as the normal CPC version! The Earth is once again being threatened by the gods, and you are the only person with the ability to stop them. You must travel through four time zones, starting in the fiery depths of hell, then moving on to Greece, Scandinavia and Egypt, where you confront the Egyptian god Dameron and must kill him to prevent him from taking over the Earth in your own time. You must also collect five teleportation globes on each level to be able to leave it. It may be a far-fetched plot, but it's a fantastic game! Ignore the rather Spectrum-like graphics (which are actually still fairly good), and the fact that there's no music – this game is an absolute classic. If there's anything good to be said about this game, it's that it wasn't programmed by Opera Soft themselves; it was coded by a freelance group. The graphics are average, and so are the scrolling and the movements of your character. 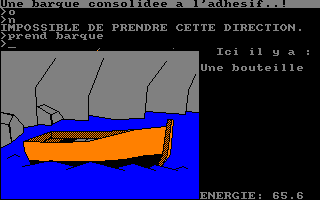 Nevertheless, Mythos is so unbelievably difficult right from the start, that nothing else matters about it. Games like this one made quite clear the crisis that Spanish companies were about to undergo at that time.